Physician-scientist Cynthia (Cindy) McEvoy, M.D., M.C.R., (above right), is professor of pediatrics, Division of Neonatology, OHSU School of Medicine, and faculty in the school’s Graduate Program of Human Nutrition. She’s a neonatologist at Doernbecher Children’s Hospital. McEvoy presented, on May 21, 2018, new findings on the impact of vitamin C on the lung health of children born to pregnant smokers. 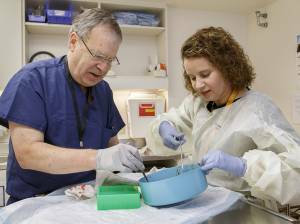 Read more on OHSU News. My focus is the study and prevention of perinatal origins of infant, childhood and adult lung disease. We know that our pulmonary function potential is established very early in life and can be affected by many factors such as the environment our lungs encounter while in-utero or in the first few years of life. 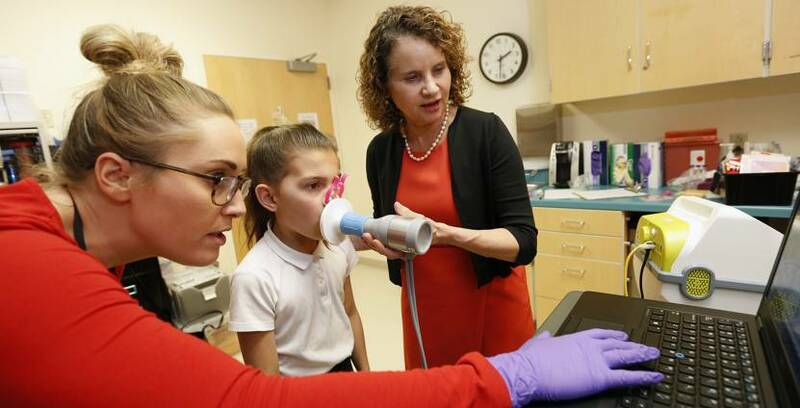 I work on projects to help maximize lung growth as early as possible to help set children on a positive trajectory that will enable healthy lungs for a lifetime. I think an infant’s transition from life in the uterus to the outside world is fascinating. I’m particularly interested in the challenges the respiratory system encounters during this transition. During my pediatric residency, I enjoyed being at the bedside and assisting these infants and their families as they moved through their neonatal intensive care experience. By studying how to improve the respiratory function of premature infants, I can satisfy both my clinical and scientific interests and hopefully improve the lives of infants, children and even adults. It’s my ability to persist in this career path of a physician-scientist by generating novel research results, obtaining grants, raising three children and serving as a role model for others. I am proud that my research results are transferable to patient care and can make an impact on long-term outcomes. I collaborate with investigators, including Dr. Eliot Spindel at the Oregon National Primate Research Center, who had a model showing that supplemental vitamin C to a pregnant primate model exposed to nicotine during pregnancy blocked some of the effects of the nicotine on lung development and newborn pulmonary function. Unfortunately, smoking during pregnancy is still a problem so I was able to design and conduct a study randomizing pregnant smokers to vitamin C versus placebo during pregnancy and show that the infants delivered to the pregnant smokers had improved lung function tests after delivery and decreased wheezing through 12 months of age. We’re optimistic that supplemental vitamin C in pregnant smokers may be an inexpensive and simple approach, with continued smoking cessation counseling, to decrease some of the effects of smoking in pregnancy on childhood respiratory health. This would have a large public health impact. How do allocate your time between clinical duties and your research program? 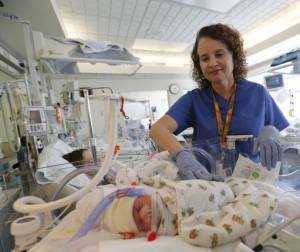 I work as a neonatologist in the neonatal intensive care unit about 25 percent of my time, including night calls and weekends. In the remainder of my time, I enjoy conducting my own research projects and guiding, supervising and advising my research team and others, including medical students, neonatology fellows, graduate students and junior faculty in research endeavors. Mentors have been critical to my success for providing strong scientific guidance and for serving as role models, confidants, champions, and help to pave the way to success. I have been fortunate to have individuals as role models throughout my entire career both locally and nationally. Time management, self-discipline and collaboration are critical but can be challenging. It’s important to have large blocks of uninterrupted time devoted to core professional activities such as grant or manuscript writing to be successful. Medical research is a team sport so it’s important to surround yourself with partners who offer complementary expertise. Medicine continues to rapidly change. Physician-scientists can take observations from the bedside and develop an investigator-initiated study based on preclinical data and biologic plausibility and then translate it into a trial that will ultimately impact clinical practice and patient outcomes. We can’t do this alone though; it takes successful collaboration across disciplines, particularly with basic scientists. You have to love it. Focus on your research and become an expert in your niche and be patient. No one is an overnight success. It takes time, but is very rewarding.